At the mention of this little-known Piedmontese grape, my teetotal father – as white and English as they come – pulled out a terrible impression of Muhammad Ali’s rhyming-couplet threat to “destroy Joe Frazier”. Perhaps the fact that he’d nosed more Nebbiolo than the wine critic at the Barolo Chronicle had something to do with it. Whatever, the boxing legend and this underdog variety will be forever linked in my memory. It’s fair to say Freisa is not the greatest. In fact, it was almost out for the count – once Piedmont’s second most planted variety, it’s little more than a palooka these days. Giuseppe Vaira, of Barolo family winery G.D. Vajra, says its decline has come about for a number of reasons. First, a good chunk of it is used for Vermouth, thanks to its vibrant acidity. Then there are the inconsistent yields, and the fact that it’s way down the pecking order when it comes to selecting sites. In addition, this highly tannic variety gives lots of harsh, malic acid. “If it’s not ripe, the acid/tannin combination kills the wine,” says Vaira. It also has identity issues. It’s commonly made “vivace”, as a slightly sweet, forthy wine for quaffing at picnics, but is a very different beast as a quite masculine, dry red. And let’s not forget the divisive bittersweet flavour profile. The Oxford Companion to Wine quotes Hugh Johnson as finding it “immensely appetising” and Robert Parker shuddering at a “totally repugnant wine”. So what does it have going for it? Well, one can never overlook breeding, and Freisa is a close relative of Nebbiolo, Italy’s king of reds. (Apparently this DNA-profiling revelation was “mindblowing” for local growers. ‘How can this crappy grape be related to noble Nebbiolo?’ is the refrain Vaira recalls.) Then there’s its comely purple colour and fragrance of wild red fruits and violets. For many, it’s a bit of a legacy grape. “We make Freisa because we’ve always made Freisa,” they quip at Bartolo Mascarello. Here it’s a dry version, but there’s no firm line taken on the spritz. If it happens, it happens, which means customers have to take the rough with the smooth – or the flat with the fizz. It’s not the kind of variation normally tolerated by wine folk but like everything at Bartolo Mascarello, the wine is good and runs out in no time. Conversely, Brezza’s Langhe Freisa 2012 (14% alcohol) is a resolutely still version, with a perfumed nose of raspberry and red cherry, zingy acid and lots of fine tannins that carry the fruit nicely. It definitely calls out for food, though – pork belly or salami would go down a treat. At Vajra they’ve gone to even greater lengths to get Freisa fighting fit. 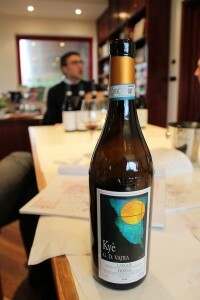 Giuseppe Vaira says the trick is to pick it late, at the same time or later than Nebbiolo. He gives it a long maceration – 20 to 25 days – before 12 to 18 months’ ageing in large, seasoned oak casks. The Langhe Freisa Kyè 2010 (14.5% alcohol; the name’s a phonetic transcription of the Italian ‘Chi é?’, or ‘Who is it?’) is a knockout. A nose of earth, cherry, plum, white pepper and spice, its rich, fine tannins and vibrant acidity give a firm frame for the juicy cherries, plums, redcurrants and herbs. Not necessarily the greatest, but it’s well worth going a few rounds with this one.